For the sake of this post, let's say that your average passenger car can hit a top speed of about 120 miles per hour. Ever wonder what would happen if a run-of-the-mill car – even one that's considered safe by modern passenger-car standards – crashed into an oncoming replica of itself? 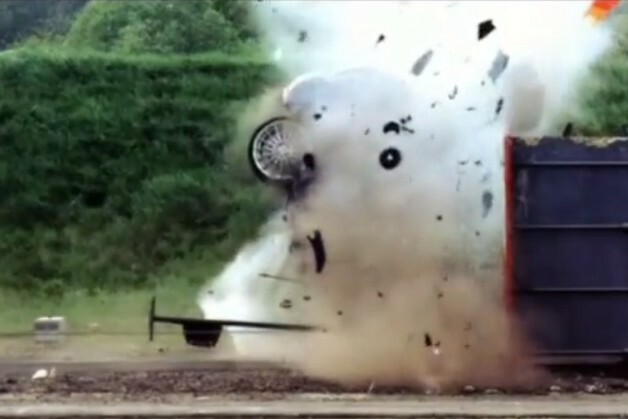 The blokes from Fifth Gear wanted to find out, so they procured an older Ford Focus, which is importantly just the kind of car you're likely to come across on your daily commute, and rammed it into an unmovable object at 120 miles per hour. That's the equivalent of two Focus hatchbacks colliding, both having been traveling at something close to their top speeds. you have to watch the video!!! make you think!!! Holy F**k!!!! I expected it to be horrible but not that horrible! they should do a veyron at its top speed next. the destruction was far worse than I imagined too. Who has seen the episode of Mythbusters where they test cars both head-on and into a wall?